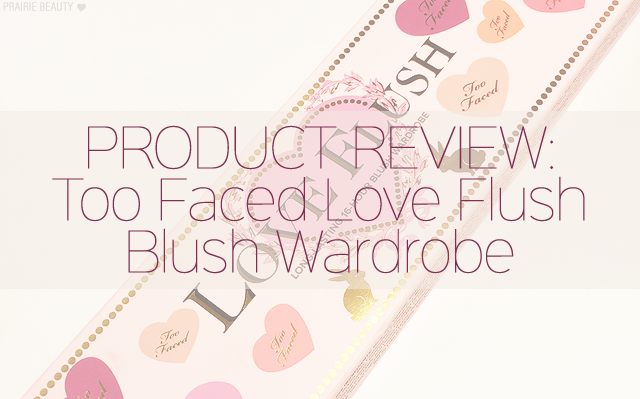 When the Too Faced Love Flush Long-Lasting 16-Hour Blush Wardrobe was announced, I pretty much A) lost my mind, and B) decided that it was going to be coming home with me after Christmas, sort of like the same reaction I had when I saw my dog at the shelter. Yes, I just compared adopting my beloved dog to buying a blush palette, because I am clearly somewhat nuts, but trust me - there was excitement and longing all up in here and the comparison makes sense in my head. If you don't already know, I'm a MASSIVE fan of blush and my collection is steadily growing to the point where I'm running out of room for it! I love blush palettes because it's easy to reach for consistently and get something for every look, but also because they tend to be a really good deal in much the same way that limited edition sets and palettes are. Anyway, I grabbed this in my Boxing Week Sephora Haul I'm ready to give it a full review! 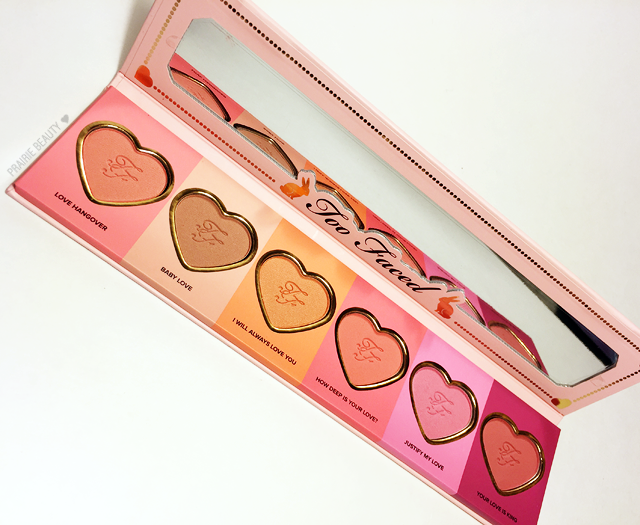 Too Faced’s Love Flush Blush Wardrobe offers six, heart-shaped pans that'll bring a pretty pop of color to any skintone. The adorable, mirrored palette features an expertly-curated range of shades in nudes, pinks, corals, and berries. With a fade- and smudge-proof formula, they'll leave cheeks perfectly flushed for 16 hours. 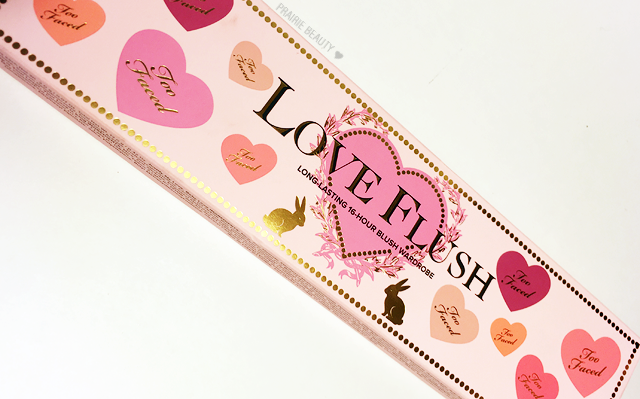 Can we just talk for a minute about how cute Too Faced's packaging is? Whoever is in charge of making these kinds of decisions needs to get some kind of raise, because this packaging is completely on point. First of all... I don't even usually like really pink and cute things, but this just had me at hello. I love the hearts all over the outer packaging and all of the gold detailing, but my favorite details are on the inside. First, each blush pan is heart shaped like the original blushes and has a gold band around the outer edge that just makes it feel special. There are also strips of colour on the inner packaging that correspond with the blush shade, which is another small detail that just gives it a little push for me. Though this palette is cardboard, it's very sturdy with a very usable mirror in the lid and a strong enough magnet that I wouldn't have any qualms about tossing this in my travel bag, both of which are big plusses for me. The packaging gets so very many thumbs up. 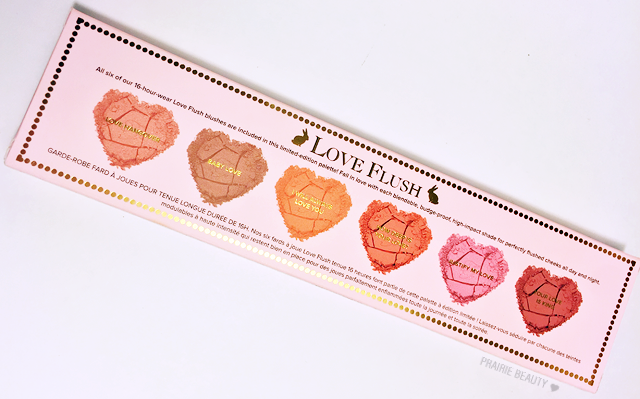 As you can see, this palette includes all 6 of the original shades of the Love Flush blushes and each pan is about 1/3 the size of the full size. If you do the math, that means that in total weight this is equivalent to 2 full size blushes. Just in case you were wondering about the cost comparison, this is the same weight in product for about 30% cheaper - and you get all six shades instead of just two! Now, there are some differences in the formulations of each shade, so I feel like I really do need to talk about them individually. Finish: Satin matte with a very subtle sheen. Texture: Soft, creamy texture. Applies and blends seamlessly. Overall: A. This is one of my favorites. Amazing formula and very wearable. Finish: Satin matte with very fine gold shimmer. Texture: A little bit powdery but smooth application on the cheeks. Pigmentation: Highly pigmented, but subtle in shade. Overall: B. Another favorite. Great for everyday wear with a variety of looks. Wouldn't work so well on deep skin tones. Finish: Glowy with a gorgeous golden sheen. Texture: Smoothest texture of the bunch. Applies beautifully and blends like a dream. Pigmentation: Good pigmentation, but a very light shade. Overall: A. This is my favorite formula, but my least favorite shade personally - which is really just a matter of preference, I know a lot of people would love this type of shade. I think this would be the kind of blush that I could only wear in the summer with some tan. Finish: True matte finish that doesn't look. Texture: Soft, creamy texture. Applies and blends really seamlessly. Overall: A. I love this shade. It's very universal and wearable for a variety of skin tones and ages. Finish: Matte with very fine glitters. Texture: The powderiest texture of the bunch, kicks up product with brush or fingers. Pigmentation: Fantastic pigmentation, almost too much if you don't use a light touch. Overall: B-. This is my favorite shade and my least favorite texture. If this shade had the same texture as I Will Always Love You, it would probably be one of my all time favorite blushes. Finish: True matte, but again doesn't have a flat look on the skin. Texture: Surprisingly smooth for a true matte blush, applies very beautifully. Pigmentation: Very pigmented, would be perfect for deep skin tones. Fair to medium skintones need to really use a light hand. Overall: A+. This is a favorite shade and perfect for winter on my pale skin, gives that healthy, just-in-from-the-cold look to the cheeks. Though I don't think I'd give them the full 16 hours of wear on my cheeks, I can definitely get a full work day out of these with good pigmentation remaining on my cheeks. Keep in mind, my skin is normal to dry, so I can't really say how these would wear on oily skin. I would say that these are all quite blendable, but with pretty much all of them you do need to use a light hand because it's easy to go overboard with pigmentation this intense. I like to apply these by lighting tapping my Sonia Kashuk No 17 angled blush brush into the product, tapping it off, and then applying starting with the apples of my cheeks and blending backwards. I feel like this makes it blend very nicely into my skin, staying exactly where I want it, and blending smoothly. All in all, I really do think that this is a phenomenal palette with a great selection of wearable shades that will suit a lot of skintones. Honestly, I feel like people of any skintone could at least find a couple of blushes in this palette that are going to flatter them. I can't find any information about whether or not this blush palette is going to be limited edition - but I hope not, because I think this is a great addition to what is already a really great permanent line that Too Faced has going for it! I'm definitely going to be looking a little closer at Too Faced in the near future!